Alcohol Effects: How Many Calories Are in That Drink? How many Calories in That Drink? How Many Calories Are in That Drink? Alcohol, when drank to excess, can cause liver disease, diabetes, heart disease, brain cell death, cancer and gastrointestinal problems – it can also make you fat. Alcohol has approximately twice the caloric content per gram as carbohydrates, and since alcohol contains no vitamins or minerals, these are truly empty calories, good for almost nothing in your body. Alcohol is converted to sugar in the body, and chronic drinking can lead to pancreatic problems, such as diabetes, as your body struggles to cope with bouncing blood sugar levels. A nightly glass of wine becomes ¾ of a pound in weight gain a month, if not burned through extra activity. Of course for alcoholics, a nightly consumption far exceeds one glass, and the potential for considerable weight gain exists – it's not called a "beer gut" for nothing. 1 bottle of beer has about 150 calories – regular beer, not strong beer. 1 ounce of vodka or gin has about 65 calories, with mixer, of course more. 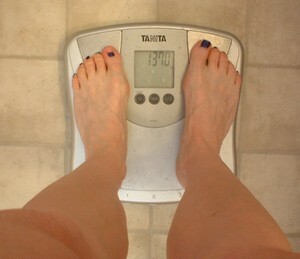 Weight gain for social drinkers can be a serious deterrent, for alcoholics, it's a necessary evil. Of course, many alcoholics aren’t fat, some seem almost emaciated, and although these alcoholics do not suffer from obesity, drinking large quantities of alcohol without gaining weight likely indicates a more serious problem. Either these drinkers consume almost all daily calories through alcohol (getting few needed nutrients from real foods) or they do eat normally, but the alcohol has affected their gastro intestinal systems to the point that they no longer process food effectively. For those heavy drinkers that do gain weight, upon quitting, in addition to benefiting socially, emotionally and mentally, most people will start looking a whole lot better in a pair of jeans! 2 Grandma's Addicted - What to Do?